If you’re like many homeowners, there’s that space above your cabinets in the kitchen that is too high reach, too narrow to put another cabinet, or too difficult to paint and paper when the time comes. So what normally happens is you end up putting a knickknack of some sort up there which quickly attracts cobwebs and dust, becoming one more thing that needs to be cleaned every so often. One good option for such a troublesome space is installing a soffit. In some circles, it is also known as a bulkhead. Both basically mean the same thing: an enclosed space beneath a structure such as a roof or ceiling. 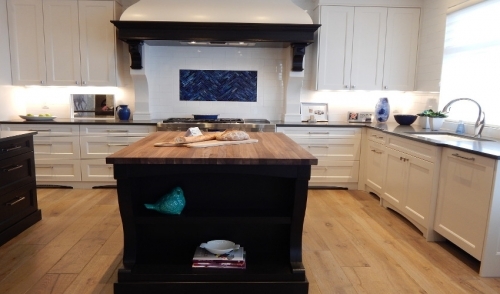 It is a relatively simple task to fill the space with a soffit, using a basic framework of 2 x 4’s and covering it up with either drywall or finished MDF (medium density fiberboard), which can be either selected to match your cabinets or painted. If you plan on enclosing the space above your cabinets, now would be a good opportunity to utilize it as a chase for wiring or plumbing, to simplify another current or future project. When it comes to the frame, you can either build it in place or assemble it down on the floor and install it above the cabinet in one piece. The size and shape of the opening will help determine which method is more feasible. When beginning your soffit project, measure precisely as you plan your framework. Sketching it out on a piece of paper can help, since there may be a lot of different lengths to work with. Remember to allow for the thickness of your MDF or drywall, so that the finished product will have a smooth plane across all surfaces. Locate the ceiling joists and determine whether or not your soffit will run perpendicular or parallel to them. If it’s perpendicular, then the top plate of your framework can simply be fastened to each joist it encounters. If it runs parallel, then you will need to screw cleats across the joists, which you can attach your top plate to. Ensuring that all is plumb, attach the bottom plate to the top of the existing cabinetry. If not already assembled, attach the adjoining short studs which will connect the top and bottom plate together, forming your box. If you wish to run any wiring or plumbing, or plan to have lighting fixtures in your soffit, rough in any necessary wiring, ductwork or plumbing at this point. Next, install your MDF or drywall over your frame. As with most finish carpentry, be careful not to damage adjoining, finished surfaces. If using drywall, use drywall tape to cover any seams and attach corner bead on the corners. Once the layers of joint compound have been applied and dried, and the surface is smooth, dust off surfaces and paint. Select an appropriate molding for where the drywall meets the cabinetry below. When using MDF, install molding at the points where different surfaces transition, for example soffit/ceiling or soffit/cabinet (in cases where the MDF does not match the cabinetry).